In the bitter cold and wind of the North Yorkshire Moors, a group of soldiers, Royal Marines and others are learning how to call in air-strikes and become 'forward air controllers' on the front lines in Afghanistan. This was the job that Prince Harry carried out during his deployment in Helmand province. Today a green barn on a nearby hillside stands in as the enemy target. 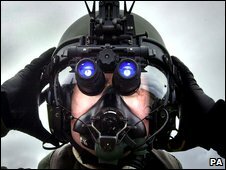 The RAF is teaching the men how to become the pilots' ears and eyes at ground level, before the personnel are deployed to Afghanistan. Suddenly, the sound of an aircraft booms somewhere through the clouds and it rapidly becomes clear that this is no easy task. I can't tell where the plane is coming from, nor at what height - yet the men on the ground need to describe over the radio in immediate detail exactly what landmarks and features the pilot should be seeing as he or she swoops at frightening speed above. A single mistake in giving the target co-ordinates can be lethal for civilians or friendly forces nearby. Warrant Officer Simon "Slap" Rowlands has already served in Iraq and Afghanistan and says that the challenges drew him to the role. "Your brain's got to be pretty agile in what you are doing in this job - but it's up to you to make sure you get all the information available to you as quickly and as accurately as possible," he says, as he studies an increasingly drenched map. "It is a big responsibility but I think it goes with the territory. You don't join up unless you are ready to take the responsibility on." The skills the men learn here will soon be put into practice under much harsher conditions, on the ground in Helmand Province, often amid the confusion of battle. Sqn Ldr Morgan Williams, the officer commanding the Joint Forward Air Control Training Standards Unit (JFACTSU) at RAF Leeming, says that if there is any doubt at all as to a trainee's competence or abilities, he will not qualify at the end of the course. It is, he admits, a demanding job - although there is no shortage of volunteers. "Clearly, if the forward air controller is under fire it becomes very difficult," he says. "You could have smoke obscuration or sand storms. There are lots of frictions on the battlefield, and the forward air controller has to fight through all of them." The school trains just over 140 forward air controllers a year, with air power a crucial - and sometimes controversial - element of current operations in Afghanistan against the Taleban. Fighter jets can be called in to fly low, as a warning to the enemy, with the dropping of bombs generally seen as a last resort by British forces. However, the number of US and Nato air strikes that have killed civilians in Afghanistan has risen in recent years, as the fighting intensifies. 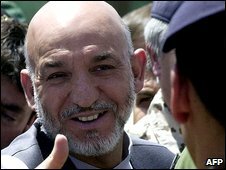 Those civilian casualties have fuelled Afghan anger, with the Afghan President Hamid Karzai begging the US and Nato last year to exercise more caution. His plea came in the wake of a US bombing raid in Herat province which killed up to 90 civilians, many of them children. For the forces themselves, there is also the danger of so-called friendly fire, when coalition aircraft have struck their own troops by mistake. Such incidents remain rare, but are devastating for all involved. "The safety of one's own troops is the first duty of a forward air controller. And if the forward air controller is in any doubt whatsoever as to where those weapons effects will end up, he will not call them in." Over at RAF Waddington, the trainees also get the chance to learn in rather warmer conditions, using computer simulators and working with the RAF personnel who many of them will be calling on for real in a few weeks' time. Flt Lt James Roycroft is a Tornado navigator from RAF Lossiemouth, who will depend on these men's instructions when he flies over Afghanistan as close air support. He says there is no substitute for air power on the battlefield. "Air support is vital. It provides, at a basic level, reassurance to the forces on the ground that there are people there who can provide assistance - and if needs be, provide real support for them in times of crisis," he says. "We have a number of systems to make sure we're looking at the right target, and that we're protecting both friendly forces and civilians. "It is vital that we preserve civilian life and civilian structures in Afghanistan - we're there to stabilise the country. So we cross-refer and check to ensure that we minimise any civilian or collateral damage." I ask if Prince Harry's deployment as a forward air controller, or what the Americans term a "JTAC" (joint tactical air controller or joint terminal attack controller), has boosted the number of volunteers for the job. Sqn Ldr Williams laughs, but says no. "I'm sure having Prince Harry come to the school may have made a few more people aware of what forward air controllers do, but it's a well-known skill within the armed forces. "We have been training forward air controllers since the Second World War."